The Lilly Center for Lakes and Streams at Grace College was the topic of a news story on InkFree News this week as directory Dr. Nate Bosch met with residents of lakes in northeast Kosciusko County gathered. A portion of the story appears below. Click here for the complete article. Rebecca Kubaki, Dr. Nate Bosch and Michael Kubaki came together to present recent information from the Lilly Center For Lakes & Streams and discuss ways to improve Syracuse Lake and Lake Wawasee. Members of the Syracuse Lake Association, Wawasee Property Owners Association, Wawasee Conservancy Association and the Lilly Center For Lakes & Streams came together yesterday, Saturday June 24, to discuss the healthy of two major lakes in Kosciusko County. 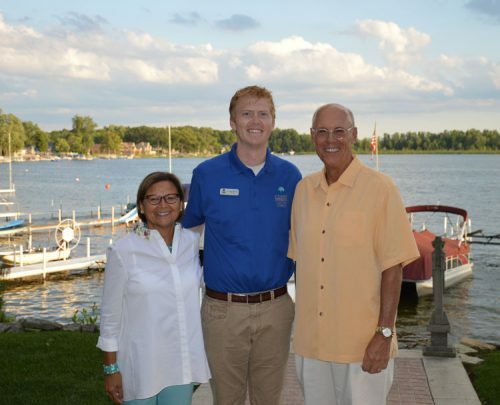 Michael and Rebecca Kubaki opened their home to host a fundraising event for the Lilly Center For Lakes & Streams, where Dr. Nate Bosch, the director of the center, discussed the changes seen in Syracuse Lake and Lake Wawasee as well as what could be done to improve them. “We are here to make our lakes and streams clean, healthy, safe and beautiful,” Bosch said. He noted that the lakes impact the health of the ecosystem, the economy and the residents in these areas. “The data shows some challenges, but they also show a glimmer of hope as well,” Bosch said in reference to the research printed in the “Your Lake, Your Story” booklet. Bosch addressed past concerns like the drought in 2012, starry stonewort, chemical spills and blue-green algae. He also stated that these lakes, along with others, bring in $313 million to Kosciusko County a year, but that could change based on the quality of the lakes. Bosch also addressed current issues like recent fish kills. He says that white bass have seen the biggest impact.